Resolution: Set Goals & Don't Flake on the Resolutions! Oh yes, it is that time of year again... time to set some goals and make some resolutions. I'm going to be sharing a few books over the next week or two that might help readers meet some of these hypothetical resolutions -- or just might be interesting to check out! If you want to change your habits and really get a head start on your New Year's Resolutions, start with this. I've read all of Rubin's books, and I usually appreciate the content while being irritated with the tone. Rubin's style annoys me a bit, and her fixation on strategically optimizing happiness in her previous books was something I could never get behind fully. I wanted to, I just don't believe that "happiness" is the primary aim of life, so it was hard to fully engage. As she says herself in this book, in a conversation with her sister, "You think I'm judgemental? ", and yes, that does indeed come across in all of her books. At least she acknowledges it here, sounding more self-aware. Rubin makes the excellent point, backed up by studies that she references, as usual, that willpower just isn't enough. To make a change, we've got to do more than just *want* to do something, no matter how much we want it. We've got to set up systems that support our goals becoming habits, habits that will become automatic and help us on our way instead of hindering. As she says, "change our surroundings, not ourselves". It's all logical, really, but she goes on to share action steps to get us to that point -- ie: if you can't help shopping online, erase the bookmarks to your favourite stores instead of depending on your ability to withstand temptation while browsing. The book is set up very logically, with an introduction to what she calls "The Four Tendencies", basically, four categories for the way in which people respond to inner and outer expectations. She then goes through how and when to manage habits for each of these diverse tendencies, and how to measure successes, as well as manage the excuses and prevarications we all make when trying to change our lives. She includes a lengthy bibliography, and notes that more habit-forming resources are available on her blog, GretchenRubin.com (actually there are tons of great things to check out over there). 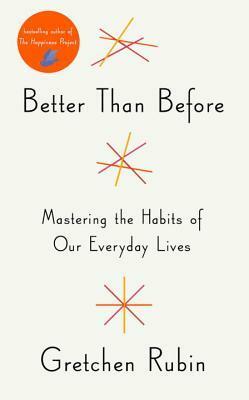 If you want help with some Resolutions this year, this is a great book to pick up. I'm going to reread it and this time make some notes and try some of these strategies. While according to her Tendencies breakdown, I'm a mix of Questioner & Rebel (which may explain why I'm not very good at resolutions in general) there are helpful tips for all types of habit forming creatures, which I'm hoping will help me achieve more of what I'm hoping to this year. If you pick up this book I hope you'll find it intriguing too. "a fixation on strategically optimizing happiness"? I'll admit I am intrigued, though I don't see happiness as the overall goal of life either. Melwyk, I enjoyed your thoughtful review and am glad that you found this book intriguing. It was certainly a timely read. Yes, very timely to revisit this book now -- hopefully something will stick! I have not read any of her books but keep meaning to. Looks good! I did like this one the most of all her books so far. Good tips. I agree with you about Rubin's style. I have found useful info in her books but they irritate me.